I saw this image in Spaceflight Now's 30-Oct-2017 article SpaceX Falcon 9 successfully launches Koreasat 5A. Pitch-black background and rocket body with extremely bright grid fins. Is this an infrared image showing how hot they are? I can't understand how they could be lit visibly from below, unless from below by the Sun perhaps? Can someone figure out the orientation of the F9 booster and the source of the lighting for this image? This is not Koreasat-5A, but SES-11/EchoStar 105, at about 21:11 in this video. The first stage rocket body is nearly aligned with the sun setting behind the rocket. We're looking "down" the rocket body, toward the East. We're beginning reentry. The upper side of the rocket body and at least the base of the fins are in shadow, and the fins are glowing red hot. 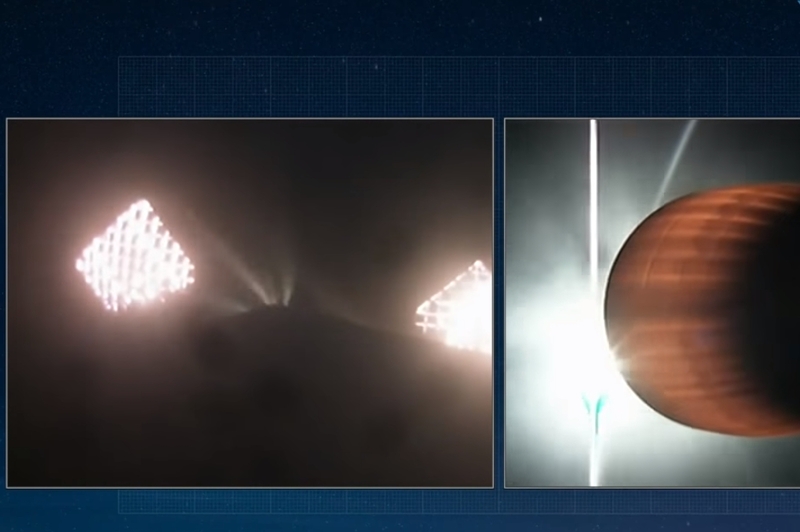 The lens flare on the right-hand (second-stage) portion of the frame tells us it's late in the day and the sun is setting in the West behind the eastbound first and second stages. Koreasat-5A launched at about 2:30pm Eastern time (and nothing in its video looked like this), but the immediately previous EchoStar 105/SES-11 launched at 6:53 pm -- close to sunset (which led me to check its video). The left side is the same camera angle we see in every broadcast; it's a color visible-light camera, and I haven't ever seen any indication of them switching to an IR camera in their webcasts.